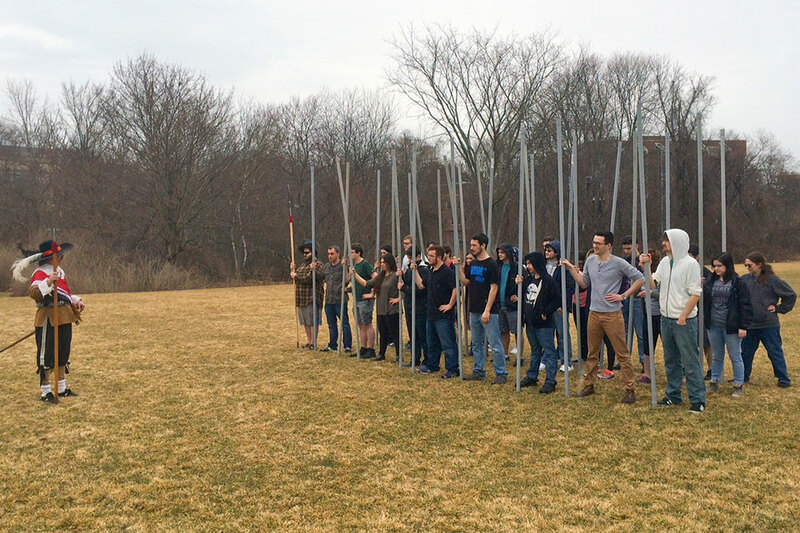 Students in Professor Govind Sreenivasan's course, "Early Modern History," reenacted a late 16th century infantry drill. Jack Davis, PhD '94, will speak at Brandeis about his Pulitzer-Prize-winning history of America's gulf coast: The Gulf: The Making of an American Sea. Moderated by Naghmeh Sohrabi, Associate Director for Research at the Crown Center and the Charles (Corky) Goodman Professor of Middle East History at Brandeis. "Cold War Landscapes: Stories from the Edges of the American Military Empire"
Speaker: Sarah Pearsall, Senior Lecturer, Cambridge University. "Arab Existentialism, Jean Paul Sartre, and Decolonization"
"Now the Old Empire has Flopped: Youth Culture, Gobalization, and the Decolonization of the English Cup of Tea"
"The Attica Prison Uprising of 1971 and why it matters today"
Mellon-Sawyer Seminar Panel Discussion: "Translating the Grenada and Iranian Revolutionary Experiences into Theory"
"The Declaration of Dependence: Central America and Re-Centering Early American Diplomatic History"
Mellon-Sawyer Seminar Kickoff: "Are Some Revolutions More Important Than Others?" "Building the Decentralized State: The United States and Colombia from Developmentalism to Neoliberalism"
Hadassah-Brandeis Institute presents "Women as Agents of Change? Fresh Perspectives on Gender & Religion"
"The King of Islandia: How Segregation and its Violence Made a Man and a Nation Rich"